Bruce Turner of TurnerBuilt, Inc. has been my contractor for 19 years. He just wrote this good advice for those of us living in earthquake territory. If you have a home entertainment center, a kitchen hutch or a large bookcase, imagine it crashing over during a quake - and what would happen to anyone underneath it. You need to make sure those hulking pieces will stay upright by attaching them securely to the wall. Do you keep lots of dishes on high shelves? An airborne dinner plate can do serious damage to anyone it hits. So can a cooking pot that takes wing from an overhead hook. 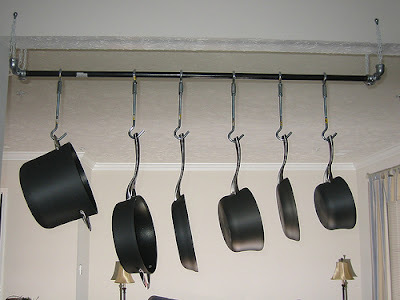 Think about storing your heavy dishes, pots, pans and china in enclosed cabinets at lower altitudes, and then add latches to the cabinet doors to keep them from flying open. There's more good earthquake-preparedness advice in the article, so you might want to read the whole thing.